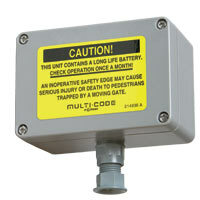 The Model 302210 Gate Safety Edge Transmitter is for adding obstacle sensing for motorized gates or barrier arms. Using a safety edge transmitter is more economical and discrete than the traditional coiled cord connection method. The Model 302210 is compatible with 300 MHz Multi-Code receivers and Model 109950 and 302850 receivers.